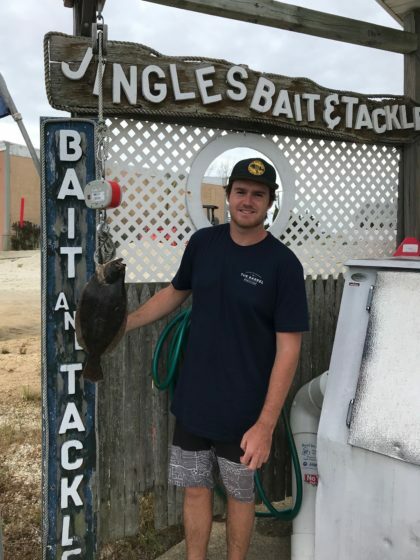 Connor McGlynn caught this keeper fluke yesterday – 2.66lbs and 18.25″. He had hoped to at least make second place for the In-Store Tournament but it was a little light. But there is still time to fish and keep fluke – 5 more days through Sept. 22nd. So we went fishing last evening over at Morrison’s after we closed. We caught a bunch of oyster crackers, as well as 3-4 sea bass. 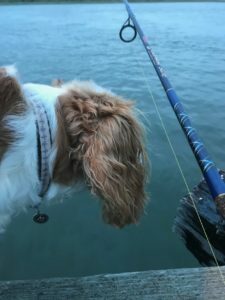 A few people were out fishing for weakfish but no luck while we were there. And as usual, Nola needs to know what is happening and be part of the action. There were more reports of anlgers catching a bunch of blowfish in the back. As well as some bluefish. The surf was still a little rough, did not get any reports. Not as wet as they originally reported this morning, yet threats of heavy downpours later today.